This is from a Times of India article but is sourced to the Jake Tapper interview with Jindal on ABC’s This Week (our effort to embed the video here was unsuccessful, so click the link to view it). Indian-American Governor of Louisiana Bobby Jindal has denied that the campaign of Republican presidential nominee John McCain is resorting to racist attacks against Democratic rival Barack Obama. “I see the Republican Party and Senator McCain going after Obama for trying to raise our taxes, for not doing enough to lower energy prices, on tapping the strategic petroleum reserve, on offshore drilling,” Jindal said on ABC’s This Week programme. “It was liberating,” said Mr. Jindal about his moment. “Up until that point, my prayer life was like a child talking to Santa Claus — making deals with God saying ‘I’ll be good, but this is what I want in return. '” Soon after, Mr. Jindal began to pray and fervently read the Bible, principally parables in the New Testament. “It was like the words were jumping out of the page. It was literally as if it had been written just for me,” he said. Newt does it again with his effusive (but well deserved IMO) praise for Bobby Jindal in his article in Human Events entitled “Bobby Jindal, America’s Most Transformational Governor”. * Six Major Tax Cuts worth more than $500 million, including eliminating taxes on business and capital investment and the largest personal tax cut in the history of the state – a $300 million reduction in personal income taxes, worth up to $500 for an individual and $1,000 for a family. * Governor Jindal brought about a Transformation of Job Creation and Retraining. He completely eliminated the Department of Labor and passed a guarantee for employers that Louisiana educational institutions will train its workforce to meet their needs, and if they fail, they will retrain workers for free. * He created $10 million in Opportunity Scholarships so 1,500 poor children in New Orleans can escape failing public schools. * Jindal led the passage of The Health Care Consumers Right to Know Act, creating transparency of cost and quality for the first time in Louisiana’s health care system. * Bobby Jindal expanded the number of charter schools in Louisiana from 42 to 100. * He passed legislation cracking down on child molesters and also passed a resolution calling for the creation of involuntary civil commitment of sexually violent predators to keep them confined for treatment after they complete their prison terms. All this, and Governor Bobby Jindal is just getting started. Just last week he vetoed $9 million dollars in pet projects and pork barrel spending in the legislature’s budget – another area in which this 37-year-old governor is showing the way to Washington. Not coincidentally, Jindal also announced that for the third time last week, Louisiana’s bond rating had been raised by a major credit rating agency. Jindal vetoes Legislative pay raise! We agree wholeheartedly with Newt (HT to RCP). Former House Speaker Newt Gingrich (R-Ga.) said Sunday that Louisiana Gov. 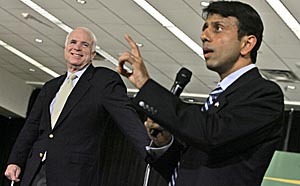 Bobby Jindal “would be far and away the best candidate” to appear on the Republican presidential ticket with Sen. John McCain (Ariz.). Gingrich, who appeared on CBS’s “Face the Nation,” heaped praise upon the former congressman, saying that he is a “spectacular” governor and predicted that Jindal would be a presidential candidate in the future. However, Jindal, who also was a guest on the show, said that he already holds the job he wants. “I’m certainly supporting Sen. McCain, will do whatever I can to help him get elected, but I’m focused on being governor of Louisiana,” Jindal stated. Asked whether it could be a problem that the governor, who is 37, might be perceived as not ready to lead the country in case he would have to replace McCain, Gingrich said the case can be made that Jindal’s “experience in the executive branch and in the legislative branch is greater than” that of Democratic presidential candidate Sen. Barack Obama (Ill.). “It strikes me that it’s going to be very hard for Obama’s campaign to explain that Jindal, as a governor, who has served as an assistant secretary of Health and Human Services, has served as a congressional staffer, has served as a congressman, is not qualified but Sen. Obama is qualified,” Gingrich said. Gingrich argued that a GOP attempt to win the election by casting the Democrat as inexperienced would fail. Commenting on the race for control of Congress, the former House leader said that the record price of gasoline could help Republicans in a year that observers now say favors Democrats. “At $4 and $5 a gallon — if you have a more production, lower cost Republican Party running against a cripple the economy, hit your pocketbook Democratic Party, this election will change radically in September and October,” Gingrich said. BTW, we have posted on this issue HERE and HERE.